Travelers are being recommended to apply for Bridging Visa B minimum 3-4 weeks prior to travel after the Immigration Department recently confirmed that it will no hard allow face-to-face appeals. As per the statement announced by the Home Affairs Department, it is in the process of modifying its online way to a self-serve basis for the majority of its’ services. From the last quarter 2018 onwards, the immigration services will now only provide in-person services to applicants of visa or businesses that have obtained a letter from the Department explicitly inviting them to serve an in-person meeting. The high number of visa applications will now require to be lodged by candidates either by post or online, as the Department assumes that inquiries will be fixed more immediately via its’ latest website. However, the Immigration Department has also recognized that more complicated visa and citizenship issues may still need face-to-face attention, and will remain to see candidates by appointment if needed. 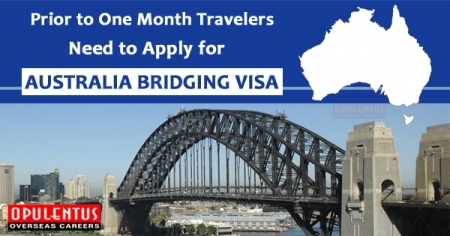 As a result, foreign travelers have also been encouraged to apply for Bridging Visa B minimum 3-4 weeks before travel. This is because the suspension of face-to-face meetings is required to improve wait times, as well as restricting the ability of candidates to direct lodgement problems in a timely fashion.